Hotmap - A good way to show your Virtual Earth (Live Maps) user base. This data is based on a sample of tile logs on servers from January through July of 2006. 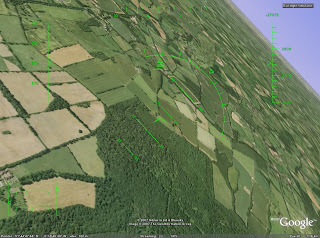 It combines server hits from road, aerial, and hybrid imagery in one view. Zoom in and out with the control widget in the top left. You can also zoom in by double-clicking the mouse; and zoom in or out with the mouse wheel. Pan by clicking and dragging on the map surface. Inspect a specific point by right-clicking. It shows the exact imagery available at the point clicked, at the current data level. 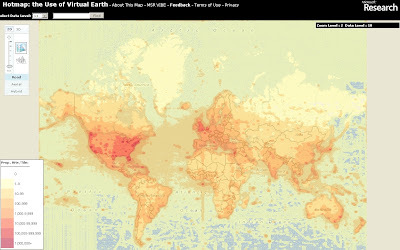 "Hotmap shows where people have looked at when using Virtual Earth, the engine that powers Live Search Maps: the darker a point, the more times it has been downloaded. Each square represents one unit of imagery, called a "tile". When the program starts, it shows tiles at zoom level 11, which has tiles at a resolution of 74 meters-per-pixel. At the closest in, Virtual Earth has tiles at zoom level 19, 0.3 meters-per-pixel. You can look at higher- or lower-resolution points with the "select data level" indicator at the top." You can Zoom in and Pan. "At Multimap we’re [they are] very proud of the wide range of local and global mapping data available on our website and through our API, and are committed to providing as much of this data via the Open API as we [they] can. To that end, we’re very pleased to announce the availability of Ordnance Survey Landranger maps (at 1:50000 scale across zoom levels 13, 14 and 15) through the Open API. The Landranger data covers England, Scotland and Wales and provides a wealth of topographic features, such as contour lines, tourist attractions and historic features such as Roman roads. These maps are great for walkers, cyclists, or for providing detailed maps of rural areas. We can’t wait to see how people make use of them through the Open API." A good but probably expensive (regards to licensing) move by Multimap. This is a fantastic UK Route Planner that works out delays, incidents and tells you the speed/traffic light camera locations along your own route. Paul Clark has developed a clean and informative results page - Colour coded to severity (shades of red). Enter your start and destination. 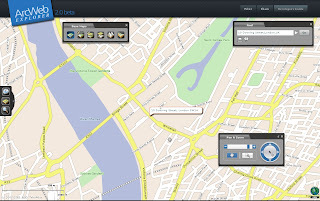 "Route Scanner uses live traffic information (e.g. 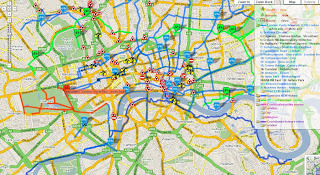 accidents, roadworks and delays) combined with a route planner to calculate which incidents could affect that particular journey. 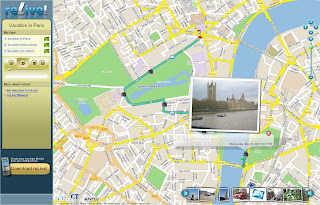 It combines the power of Google Maps with the real-time information provided by BBC Travel and the Highways Agency. Route Scanner doesn't just look for traffic and travel updates on motorways and other major roads but through the road network." 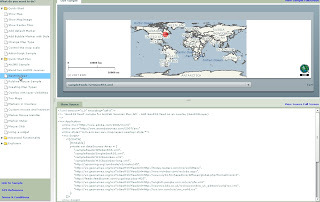 ArcWeb Explorer 2.0 application, which offers powerful Web map rendering with desktop-like functionality. The rotating map is a clever bit of code - the text flips (renders) itself when it goes beyond 180 degrees. To use this service you will be required to login in. Both have the code generated on the fly - therefore it is faster to get up and running with your own apps and data. Is this to challenge the likes of Google Maps, Virtual Earth and Yahoo Maps API's? At first glance locations seems displaced. But in the Google map (below) locations are in the correct location. 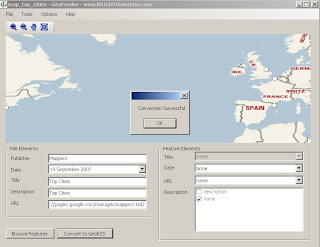 "Yet the problem remains that most geodata is locked away in formats that don't play nice with the major web mapping providers"
"That’s where BRIGHTi GeoFeeder comes to the rescue"
"Beyond browsing GIS data, MapServer allows you create "geographic image maps", that is, maps that can direct users to content"
debug levels and more control on output location. Google Maps coverage expands... 54 more countries covered. In combination with the Google Maps API you can now view the new tiles via her mashup. note1 - the Google Geocoder is not perfect. *Note- Additionally, the limit on functions per spreadsheet is 50. Click a hyperlink to view the new coverages - some are limited in content. What is MapMixer? "The world is a big place. There are thousands of maps out there that provide unique details about any given destination. 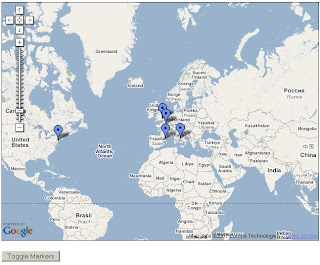 MapMixer is a new site that combines those maps with Yahoo! Maps to give you a better view of the world. It's easy to mix your own map. Upload an image of your map, use our layering tool to align it with Yahoo! Maps and we'll do the rest! Your map will have all the features of Yahoo! Maps (zooming, panning). You can also syndicate it on your own site or blog." Upload your jpeg,gif or bmp. Two Points are needed to estimate the geographical position of the image. Traditionally in a GIS environment this is at least 3 points. Use the green circle to rotate the image - this helps to get an exact fit of the image. *rotated image exaggerated here for example of the function. Reproduced from Ordnance Survey map data by permission of the Ordnance Survey © Crown copyright 2001. Reproduced from Ordnance Survey map data by permission of the Ordnance Survey © Crown copyright 2001." not sure about the hula hooping mice - a progress bar maybe? Elevation - A lunar terrain map generated by the USGS in conjunction with the The Unified Lunar Control Network 2005, and shaded using an airbrushed shaded relief map. This map is colour-coded by altitude, so you can use the colour key at the lower left to estimate elevations. Apollo - A collection of place marks that tell the story of the Apollo missions that landed on the moon. This includes stories, quotes, images, panoramas, audio clips, and links to videos of the astronauts' adventures on the lunar surface. 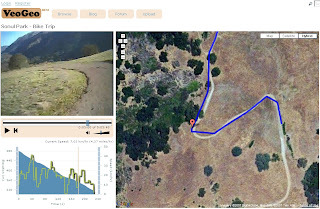 "Mapnik is a Free Toolkit for developing mapping applications. Above all Mapnik is about making beautiful maps. It is easily extensible and suitable for both desktop and web development." "As always, there are lots of things in the pipeline"
go to the Demo Area of MapNik website for more examples. Ordnance Survey have launched 'OS Explore', a website designed for walkers, runners, hikers, cyclists, anyone with the interest with the great outdoors and sharing their routes and personal favourite places. No Polygon creation (Area) - only Lines and POI Points. Well it's a start from the Ordnance Survey - but clearly in Beta. Add your comments on the service - maybe they take note, maybe not. "Unfortunately, at the current time, users are unable to edit routes once they have been saved. However, before saving, users are able to undo waypoints they have plotted and remove their points of interest. There are several usability changes envisaged for the next release and this is an area we would like to see improved. The site is still in its beta stage so obviously we are keen to hear about any issues encountered." 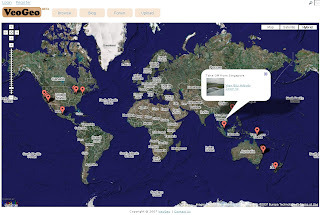 Ask City map now allows you to embed the maps into your blog/website similar to Google Maps. Though 'Ask' has a clever function not seen before - searching within a polygon. How is this function achieved? a little search magnifying glass appears. There is a some way to go, only a few results where returned. Looks like the bounding box was (map extent) was used rather than the actual polygon. But a good step in the geographical spatial search method. Real spatial searches in 'Search Engines' and web based maps? Maybe very soon. A quick fast method would be to send the centre coordinates with a radius distance and use a spatial database (postgres is extremely powerful and fast at this) to return all the locations based on the search terms to give the user the first ten. *postgres can do this in milliseconds. The Campaign to Protect Rural England (CPRE) has releases New Maps depicting the Intrusion of many sources (traffic, rail, air, dense population, power lines etc) that lead us to a more intrusive way of life. Where are the least intrusive places? "The largest remaining areas of unspoilt countryside are mostly in the national parks - Dartmoor, Exmoor, the Yorkshire Dales, the North Yorkshire Moors, the Lake District and Northumberland. Shropshire and the North Pennines are also largely free from noise and eyesores." In the latest release (v2.88) of the Google Maps API, Lines (Polylines) and Polygons are now clickable events to GPolyline and GPolygon, much to the enthusiasm of developers in the Google Maps API Group Forum. Since a few developers started speculating on how this is being implemented in the API, all the juicy details right here. Warning: Algorithms ahead! Which segment of the polyline is the closest to the click. Click detection begins by measuring the distance (in pixels) between the clicked point and the polyline. For each segment of the polyline, the computed distance between the clicked point and the nearest point along that segment. Then take the minimum of these distances as the closest segment; if the distance is then small enough, it is declared as click on the polyline. Given the bounds of the currently visible map viewport, discarded points which are off screen. This can drastically reduce the number of points to consider. Zooming out from a detailed polyline, generalising the segments of the polyline into a simpler group of segments without noticeably changing its shape. In the example below, a simplify a polyline from 9 points at the highest zoom level to 4 points at a more zoomed-out level. If a clicked point is far away from a segment, it is discarded from consideration. Taking advantage of this fact by pre-computing the bounds of groups of segments; if a clicked point is far from these bounds, it skips distances for all of the enclosed polylines. By recursively combining these bounds for larger and larger groups of segments, "bounds tree" that allows to skip most of the segments when performing hit detection. This dramatically speeds up polyline hit detection. For example, detecting clicks for complicated polylines like the Camden Cycling Map. 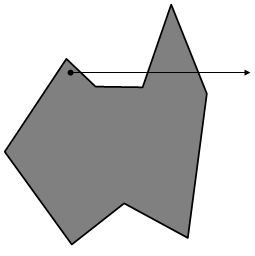 Detecting whether a clicked point is within a polygon is more straightforward, and less open to interpretation. We first draw a straight line from the clicked point to the right of the screen. Each time this test line crosses a segment of the polygon, it changes state from being inside to outside or vice-versa. If the test line crosses an odd number of segments then the point is determined to be inside the polygon, whereas if the test line crosses an even number of segments then the point must be outside. Many of the same improvements for polylines in polygon detection, using the map viewport and zoom level to drastically reduce the number of segments to consider, and using a bounds tree to avoid performing unnecessary intersection tests. Camden Cycle Campaign is one of the very first to use this functionality in full effect. Well done. "Our primary aim is to get more people to cycle and to improve things for those who already do so." VeoGeo takes video sharing to the next level. Now you can map the activities you video, and share even more of the experience! See what people from around the world are doing, and see where they’re doing it! This could take off with GPS and Video Capture on Mobile Phones. The N95 could be used in conjunction with Sports Tracker and the 5 mega pixel camera. As the video is played the map has a route and marker that moves in relation to the geographic position in the video. A nice touch is the graph that shows both speed/acceleration and elevation. Google Earth Allowed At Work! Great News to users of Google Earth but the restriction is limited to Internal Use only. Version 4.1 "You may not use the Software or the geographical information made available for display using the Software, or any prints or screen outputs generated with the Software in any commercial or business environment or for any commercial or business purposes for yourself or any third parties." "For a business entity user, the Software may be used by you and your employees for internal use"
"Google Earth Free finally becomes a proper universal browser of georeferenced data." Mapperz see's this as a great way and potential improve Google Earth and make it into a Simple GIS. 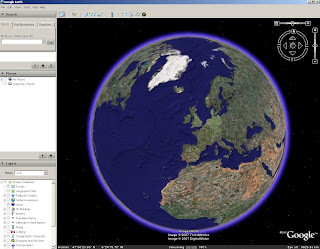 What's the difference between Google Earth, Google Plus and Google Pro? 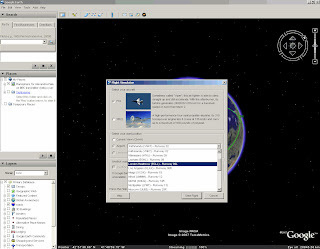 "Google Earth EC" is the enterprise client. "Download! for PC enables you to discover mobile content using a PC. When you connect your mobile device to the PC, Download! for PC automatically synchronises with the corresponding software on your device. This makes it easy for you to find, download and manage content (maps) that is compatible with your device." A Good Mobile Browser that allows you to view web based mapping now in landscape mode. "Your Stuff. Any Phone. Everywhere." A good resource for finding and sharing Apps, Software,Music, Maps, Games, Pictures, Ringtones etc. reLive! 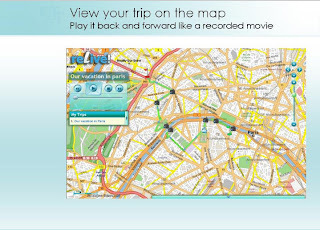 a unique and handy leisure application, allows you to take photos and write notes along your trip route, and seamlessly attach them to their locations on the map (geo-tagging). "On Wednesday, 14 November 2007, Eurostar launches services from St Pancras International, our new home in the heart of London. Experience faster journeys on High Speed 1." Waterloo continues to be a major hub in London's Public Transport Network but will not be an international station after 14th November 2007. "Note that until you enter flight simulator mode, the following commands do not work."